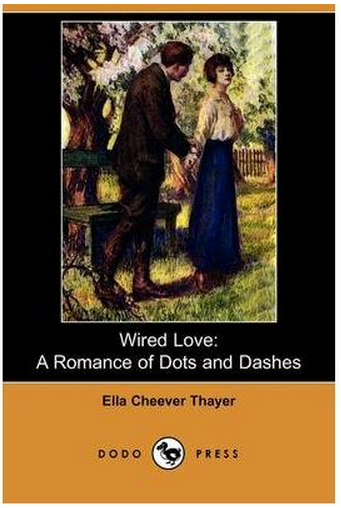 'Wired Love- A Romance of Dots and Dashes', by Ella Cheever Thayer (1849-1925), is an enchanting book about a love affair between two telegraphers in America, code names 'N' and 'C'. The couple fall victim to the dangers that internet chat-room users are faced with today: they begin to fall for the stranger on the other end of the line without knowing what they look like, who they are, or anything much about them. For the first few chapters, 'N', known as Nattie, has no idea if the grapher on the end of the line is a man or a woman. She leads a double life - her 'online' life and her humdrum normal life. 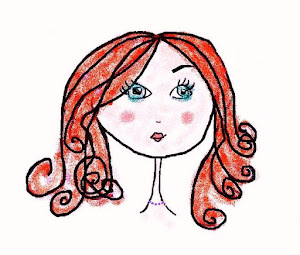 She has her real, 'visible' friends, and this increasingly special 'invisible' friend. More and more the 'invisible' variety takes precedence. How many of us can relate to that? 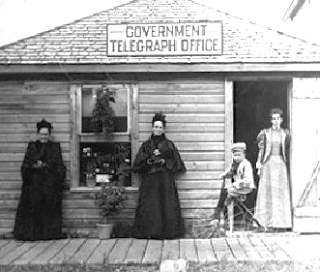 The amazing thing is that the story was written in 1879. It is clear that Cheever Thayer is a huge Dickens fan; her characters are cartoon-like in their depiction and comic too. Like the Pocket family in 'Great Expectations', who are continuously described as tumbling and falling, so too is the love-sick Quimby, as he tumbles and falls, over logs, cushions, fire buckets etc. He is something akin to Stan Laurel and you cannot help but warm to him and respect his good taste as he is so enamoured with our witty heroine. The novelist actually refers to two Dickens novels during the story as a nod of respect the great English writer who had died just nine years before this book was written. The humour in this novel is touching and farcical at times, in the way of P.G. Woodhouse, and I found this to be one of the most charming aspects of the book. Charming is the perfect word for it as you fall in love with the characters and delight in the myriad of misunderstanding that makes this novel so highly cinematic. Indeed, it would make a wonderful play and an even better movie. As such it would have been a perfect role for a young Jimmy Stewart and reminds me greatly of 'The Shop Around the Corner', which was recently re-made and updated as 'You Got Mail', starring Tom Hanks and Meg Ryan. If you like either of those films, then you will love this book. It is full of witty, sparkling dialogue, plenty of puns and word play, especially when they chat on 'the wire', and could easily be adapted into a modern tale about find love on the World Wide Web. '... She had growled at herself all the way because she was not smart enough to get on in the world, even so far as to be to stay at home in such weather. For storms of nature, like storms of life, are hardest to a woman, trammelled as she is in the one by long skirts, that will drag you in the mud, and clothes that every gust of wind catches, and in the other by prejudices and impediments of every kind, that the world, in consideration, doubtless, for her so-called "weakness", throws in her way'. Such words of frustration echo Bronte's novel written some thirty years previously, but would not have been out of place if there were said by Jane Eyre herself! So while the book has a light, romantic tone, there is substance there all the same and you do not need to dig very deep to find it. 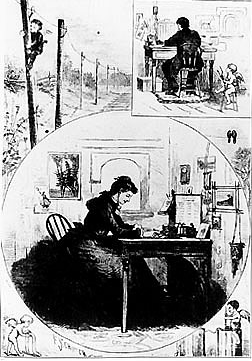 But what is most memorable about this book is the voice of the author; this vibrant, clever, witty woman, who had worked in a telegraph office herself, and had spoken in morse code on the wires, and, perhaps, had experienced some of the funny situations that she describes so deftly in the book. A regular reader will finish this short book in a day, and what a pleasant, romance-filled day of smiles that will be! #PurelyForPleasure - Free on Kindle /Gutenberg.org ebooks.